Terra. . HD Wallpaper and background images in the Los Jóvenes Titanes club tagged: teen titans teen titans terra dc comics. thats not terra! thats Power Girl! Super mans cousin. she used to be Super Girl. ok, after looking at that some more...AHHHHHHHHHH! ok, so the girl in front, no clue who that is, but its not terra OR power girl. but the chick in the background is definetly power girl. the comic book terra has short,fluffy blonde hair 80s hair. not black...and her costume is WAY different. ill post a pic or sumpin to show u guys. 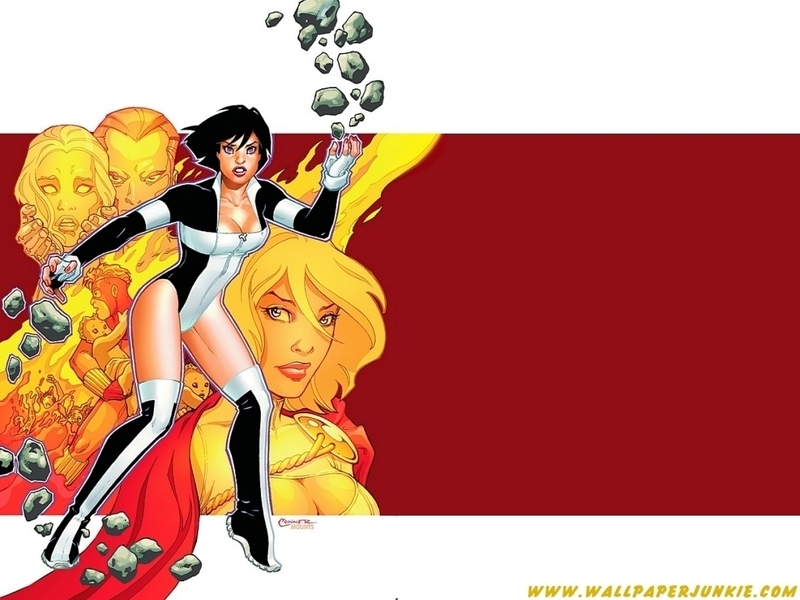 That is Terra but its not the Terra out of Teen Titans - the Terra ( in Teen Titans ) real name is Tara Markov and that Terra ( the Terra in the wallpaper ) real name is Atlee she's the 3rd Terra , oh and Lucy64 i definetly know thats Power Girl in the background coz Terra ( Atlee ) and Power Girl r friends .